First lets talk about Appointment. If you want to schedule an interview in Appointment you need to click New on the top left of the RecruitBPM Dashboard. Click Appointment on 3rd last option in this menu. It will take you to a new form where you can schedule an Interview or a Meeting in this topic we will discuss about scheduling an Interview. We will discuss how to schedule a meeting in our next topic. 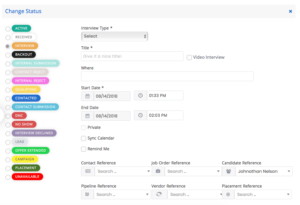 Here you are required to fill all mandatory fields including title, start date, you can also check the Video Interview checkbox to conduct a video interview. Fill up rest of the field and click Save to schedule the interview. You can simply click on status a new lightbox will open where you can schedule an Interview of the candidate of your choice. Fill up the fields. You can notify Job Owner, Assigned Recruiter, Assigned Source, Candidate and Contact via email just click all the checkboxes in the Lightbox. Isn’t is easy.